Politics heated up in Madhya Pradesh, ahead of Rahul Gandhi's farmers rally in Bhopal, on Friday as a poster depicting the Congress president as Lord Ram and Prime Minister Narendra Modi as demon king Ravana surfaced in the city. 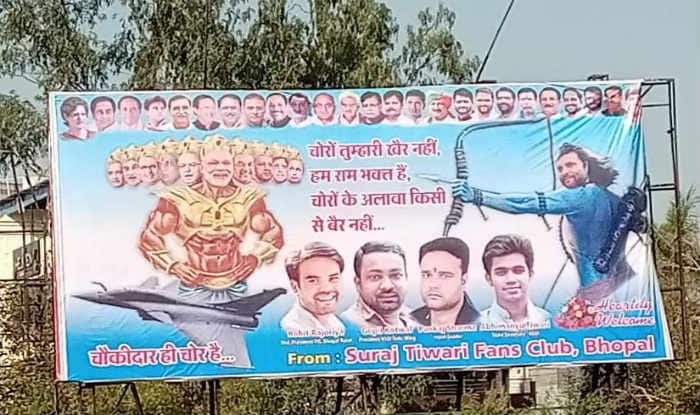 Bhopal: Politics heated up in Madhya Pradesh, ahead of Rahul Gandhi’s farmers rally in Bhopal, on Friday as a poster depicting the Congress president as Lord Ram and Prime Minister Narendra Modi as demon king Ravana surfaced in the city. Ahead of his visit, several posters have been put up in Bhopal in which he is described as ‘Ram Bhakt’. “Will build Ram temple in Ayodhya with consensus, we welcome such Ram Bhakt,” the posters read. Some even addressed the Congress president as ‘future prime minister’. The Gandhi scion will reach Bhopal in a chartered plane at 2 PM and will take helicopter to reach Jamboori Maidan, the venue of ‘Aabhaar Rally’. During his over 2-hour visit to the state capital, Gandhi will also meet party legislators and farmers. All top Congress leaders from the state, including Chief Minister Kamal Nath, AICC general secretary in-charge for Uttar Pradesh West Jyotiraditya Scindia and former CM Digvijaya Singh, will participate in the rally. Congress spokesperson Pankaj Chaturvedi claimed more than two lakh farmers from the state are likely to participate in the rally. Party’s media cell coordinator Narendra Saluja termed it a ‘thanksgiving rally’ where farmers would felicitate Rahul Gandhi for the farm loan waiver announced in the state after a Congress-led government under Chief Minister Kamal Nath took over on December 17. This is not the first time that the party leaders are promoting Rahul Gandhi in such a manner. Earlier during the Madhya Pradesh Assembly Elections 2019, the leader was described as ‘Shiv Bhakt’.